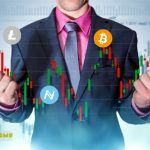 The cryptocurrency market is trying to complete the correction period and develop a new wave of growth in order to update the highs. Perhaps this will be the last impulse before the formation of a medium-term wave of decline. If we look at the BTC dynamics on the 4-hour timeframe, we can see that the market continues to develop an upward trend of the medium-term scale. The current growth trend looks pretty stable. Having reached the resistance line, the BTC/USD entered the correctional “Triangle”. Such a correction format may suggest further overcoming of the resistance zone near the level of $ 4044 and a rise to the projection resistance of $ 4255. The MACD indicator lines directed upwards, which, in turn, act as prerequisite for the development of the growth scenario. Local support is $ 3840. Its breakdown will be a signal to decline to the line of medium-term support - $ 3516. 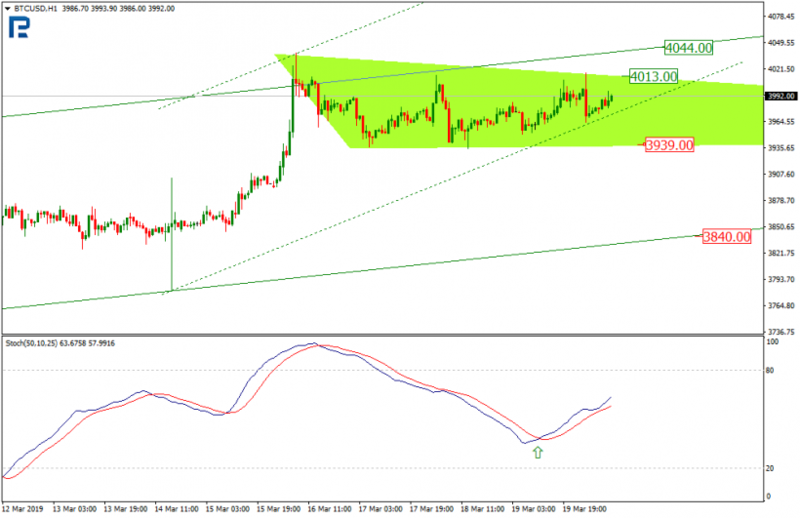 When considering the 1-hour chart, we can see that the Stochastic indicator has formed a “Golden Cross”. We may consider this as a signal of the beginning of the growth impulse development for the breakdown of local resistance at $ 4,013. The short-term technical picture builds a corridor of upward dynamics. Local support is the level of $ 3939. Over the past week, EOS was able to overcome the internal short-term resistance line, but it has not yet succeeded in updating local highs. The 4-hour timeframe demonstrates the formation of an ascending “Triangle”. 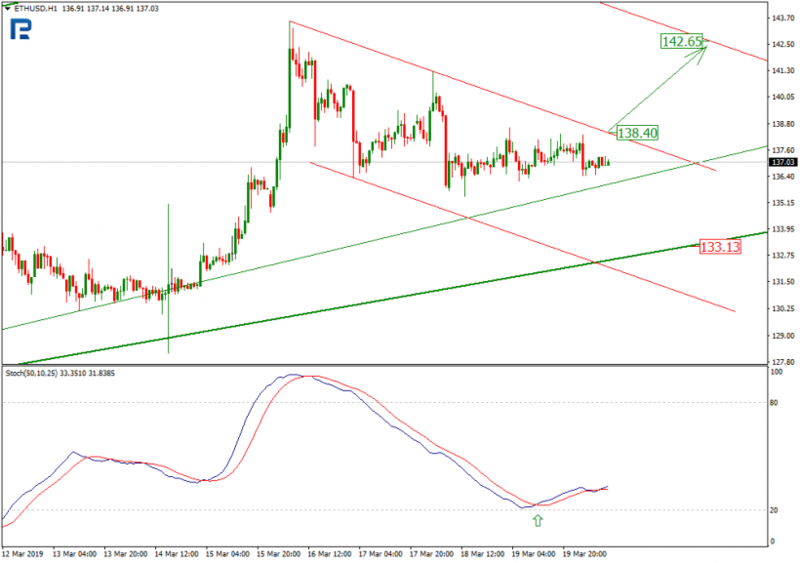 It is worth noting that the downward direction of the MACD lines may indicate the possibility of a breakdown of local support and a decline to $ 3.42. The main support is the level of $ 2.87. Based on the overall mid-term focus of the market up, you can consider the option of breaking the local resistance level - $ 3.90. After that, the path to the levels of significant highs at the $ 4.55 mark will be opened. 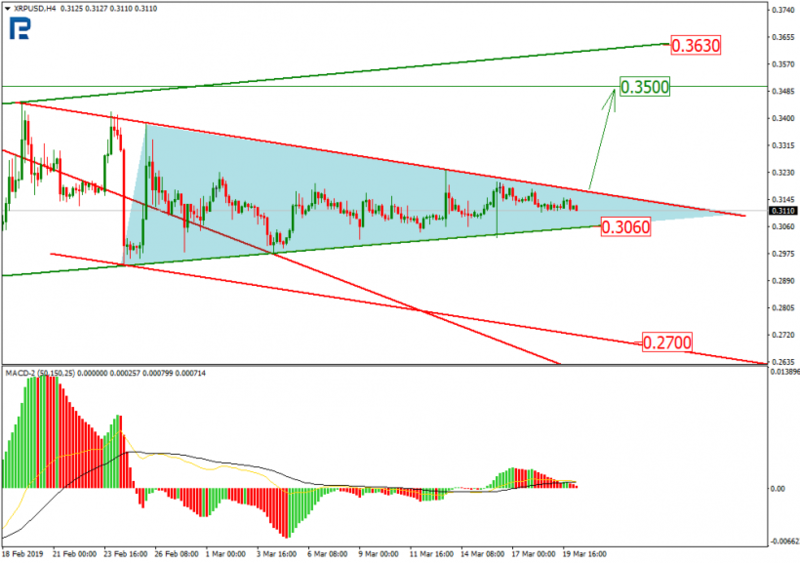 The 1-hour chart demonstrates a local downtrend directed to the support line at $ 3.75 with the possibility of reaching the next level of $ 3.68. 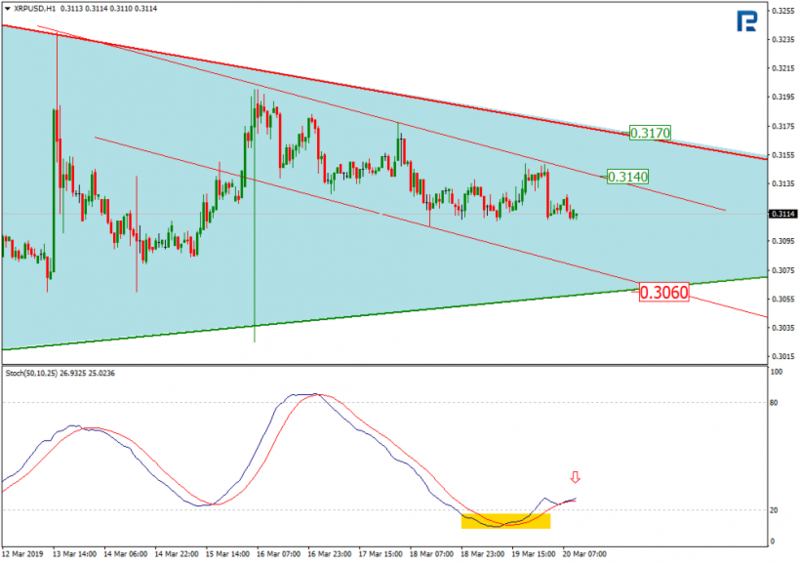 At the same time, we note that the Stochastic indicator is directed upwards, which may suggest further breakdown of the resistance line at the level of $ 3.81. Further, we can expect testing level of $ 3.90. The short-term picture of Ethereum's 1-hour chart demonstrates the movement of quotes within a descending corridor. At the same time, the Stochastic indicator formed the “Golden Cross”, which serves as a signal for a change in trend. But for now the market is only trying to push off from the support area. Breakdown of short-term resistance at $ 138.40 will allow reaching the level of projection resistance - $ 142.65. 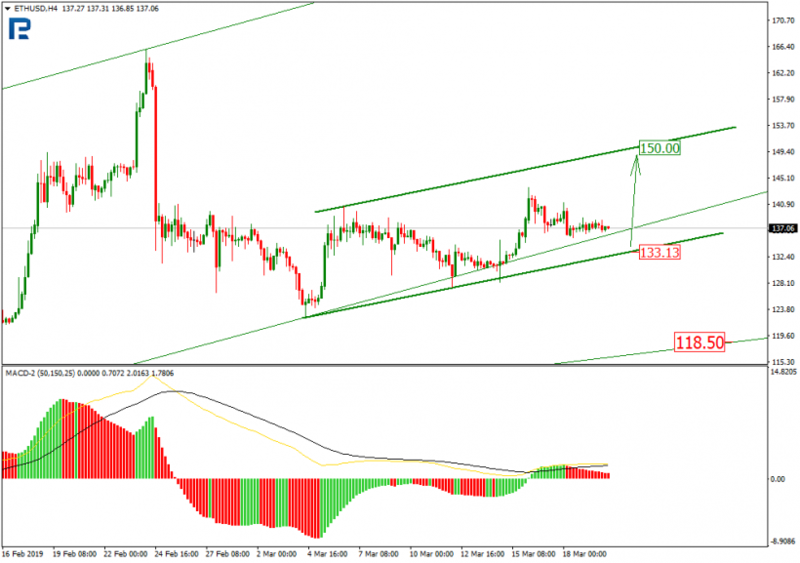 Looking at the 4-hour chart of Litecoin, we see that the LTC/USD is, at first glance, within a stable growth channel. But if you look at the MACD indicator, you can see the “Black Cross” after the divergence, which is a strong enough signal for the development of a downward trend. It should be noted that the quotes are testing a local support line, the breakdown of which will open the way to reduce to the main current support - $ 52.65. Breakdown of this level will open the way to reduce projection support by $ 40.70. The technical picture on the 1-hour chart Litecoin indicates the potential for the development of a new impulse to decline after leaving the local consolidation corridor. 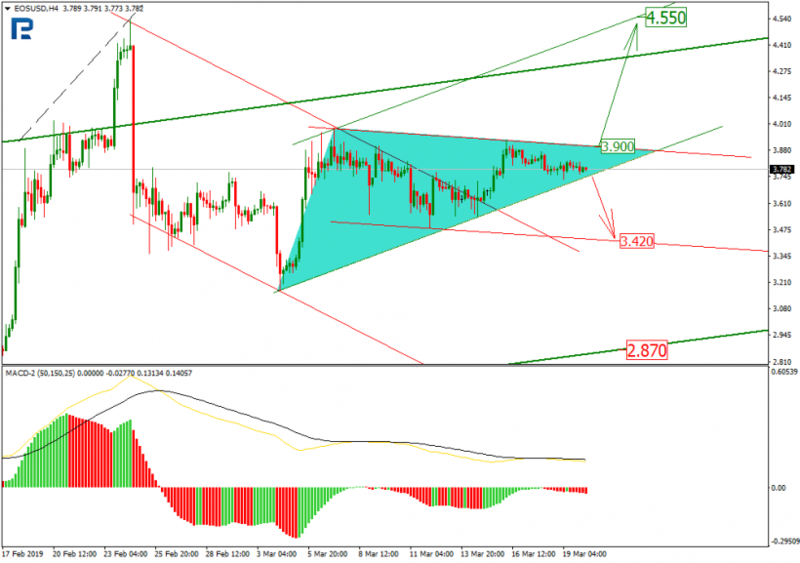 This situation is able to serve as confirmation of the hypothesis of a change in trend. The breakdown of local support at $ 58.36 may be a signal of a decline to the level of $ 53.20. In turn, the breakdown of local resistance at $ 59.56 may be a signal of a new wave of growth to the resistance level - $ 64.46. Looking at the 4-hour chart of XRP, we see that the market continues to move in the "Triangle" with thorough testing of support for the medium-term growth channel. 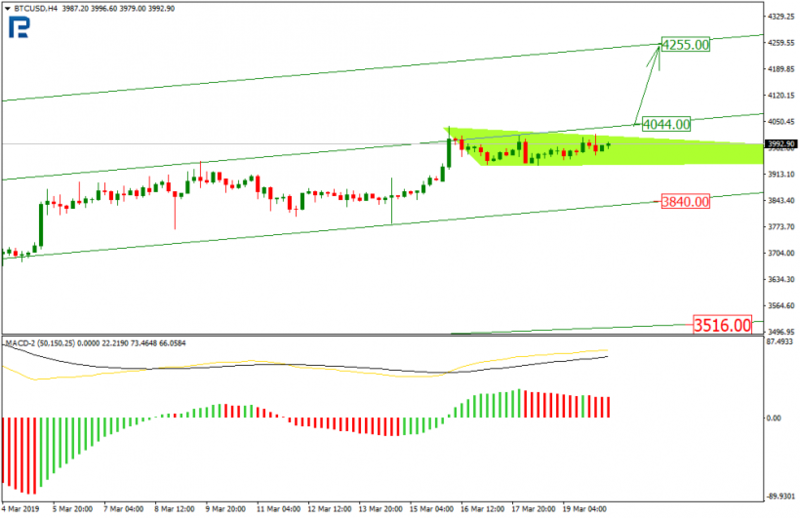 In the technical picture, it is worth noting the entry of MACD indicator lines into the positive area, which may indicate the potential breakdown of the current resistance and the rise to the psychologically important level of $ 0.3500, and later to $ 0.3630. 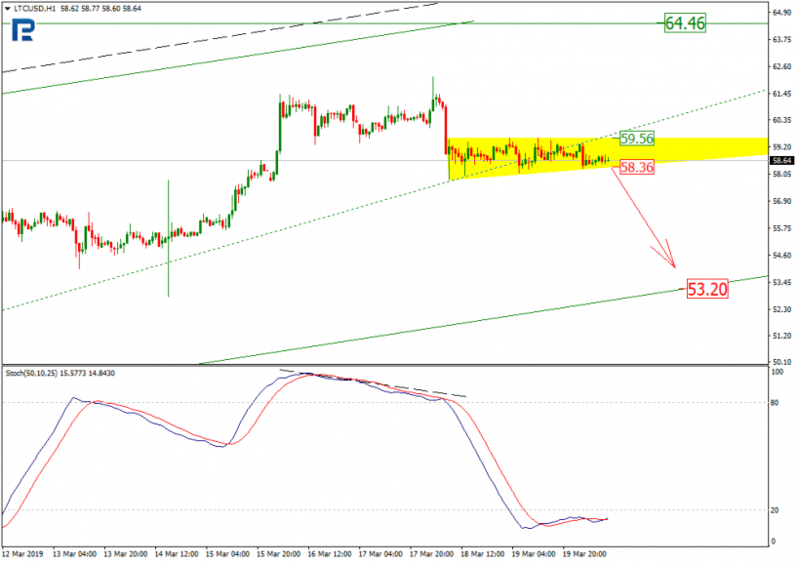 Given the possibility of a breakdown of support in the $ 0.3060 area, quotes may fall to $ 0.2700. On the 1-hour XRP chart, there is a movement of quotations within the local downstream channel. 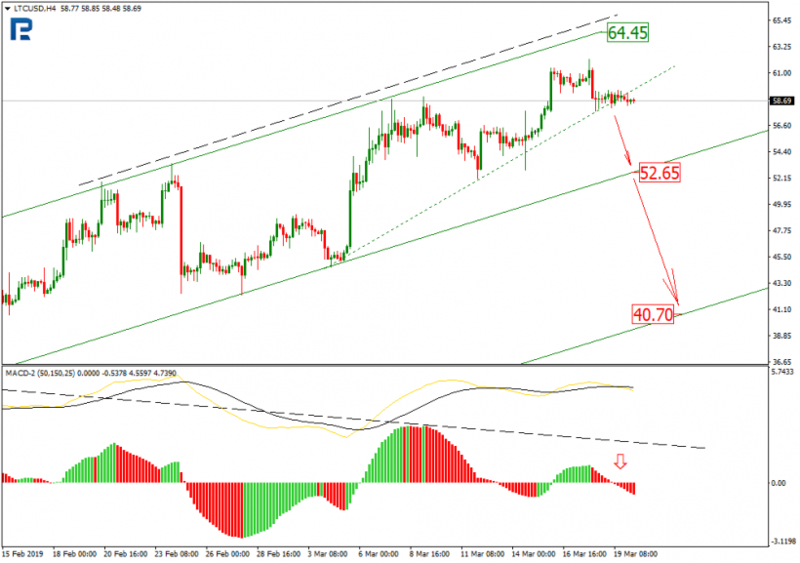 The aim of the decline may be the support level at $ 0.3060, but to confirm it is worth waiting for the formation of the “Black Cross” at Stochastic. 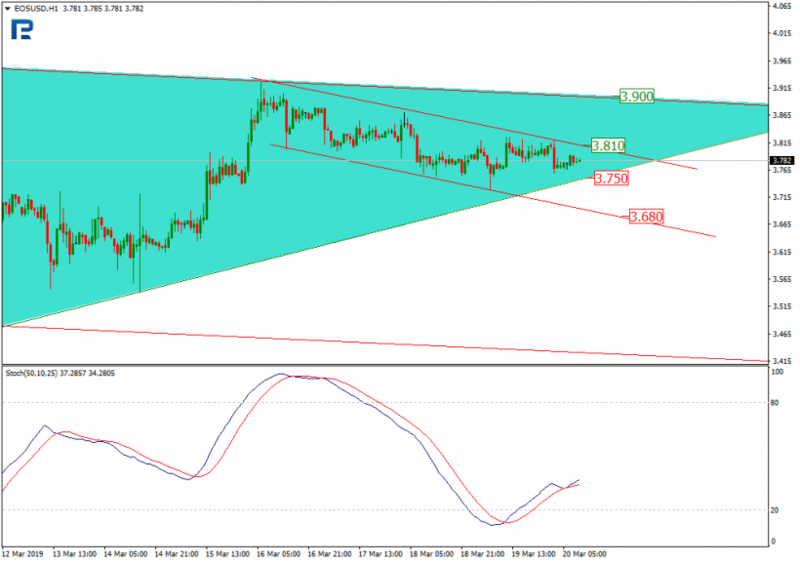 In the short term, a rise in resistance to $ 0.3140 is possible to test it. © 2018 bit.news | queries 218, for 0.159 sec.